Jantar Mantar Jaipur is located in the capital city of Rajasthan. It has a total of 19 architectural astronomical instruments, which are built inside this monumental structure. Its construction was completed in 1734 CE, and it was built by Sawai Jai Singh II. It is a UNESCO world Heritage site and it has world’s largest stone sundial. Sundial is a structure or a device which tells the time based on the position of sun. It is located near Hawa Mahal and City Palace of Jaipur. Jantar Mantar was damaged in the 19th century, after which it was restored. The name of Jantar Mantar was derived by Sanskrit language and its literal meaning is Calculating Instrument. This place has many instruments which were made as per Sanskrit texts, and the principles of astronomy and instrument were used. Many astronomical positions can be observed by these magnificent instruments. Jantar Mantar light and sound show is another interesting thing here, it depicts the history and details of this place. Jantar Mantar opens at 9:00 AM and it closes 5:00 in the evening. Ticket counter opening timing is 9:00 AM and the counter closes at 4:30 PM. The authorities are very strict with the timings. The monument closes in the evening, near sunset. Jantar Mantar opens seven days a week, so there is no need to take care of visiting day. 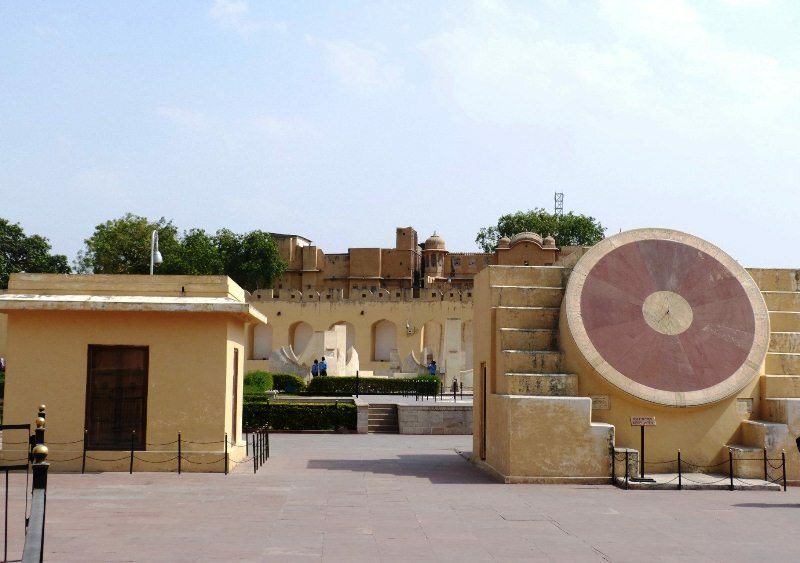 The best time to visit Jantar Mantar is October to March. jantar mantar jaipur light and sound show timings are 6:30 and 7:30 PM. Its runtime is 45 minutes. Jantar Mantar Jaipur ticket price is 50 Rs for Indians. Foreign nationals need to pay 200 Rs as Jantar Mantar Jaipur entrance fee. Camera is allowed inside the place with additional 50 Rs charges. So it is a good idea to click some good pictures inside the place. Entry is free for child up to 7 age years of age. Booking a guide could be a good decision, if you are interested in the details of this place. It might cost you somewhere around 200 Rs. It is located near Hawa Mahal and City Palace, in Tripoliya Bazar. The complete address of Jantar Mantar is : Near City Palace, Tripolia Bazar, Jaipur, Rajasthan. The city is well connected with the rest of the country. Jaipur is 300 Km away from Delhi, National Capital of India. Jaipur has airport, railway station and bus terminals, hence these mode of transport can be used. Distance of Jantar Mantar from railway station is 6 Km. So the travel time is somewhere between 20-25 Mins. Chandpole metro station is the nearest metro station, located 2 KM far. The city of Jaipur is called as pink city, and it is full of monuments. The city is well connected internally, by buses and metro. The nearest bus stand is Tripoliya Bajar, from where it is a few minutes walk to the monument. Basic facilities like drinking water and toilets are also available inside the premises. There are many places to visit in this city. It is a hot favourite destination of tourists around the world. The city gets very hot during the summer, therefore the suggested months are from October to March. It has a lot to offer, so history lovers are bound to get very excited on their roam around the city. Also check Jaipur Zoo, Amber Fort, Hawa Mahal and Jantar Mantar Delhi.